The recently announced winners of the 2008 AIA COTE Top Ten Winners unearthed some fantastic projects - and a whole lot of sustainable features and some Vegetated Architecture as well. In honor of Earth Day 2008, we thought it appropriate to showcase those verdant and green selections here. 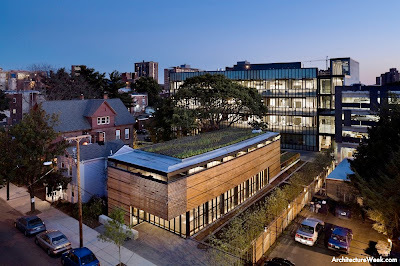 The Yale University Sculpture Building and Gallery by Kieran Timberlake Associates features sustainable landscape in a number of ways: "The green roof on the gallery and native plant landscaping, which includes mature trees, serves as a connective habitat patch for avian species moving through the urban corridor between these parks." 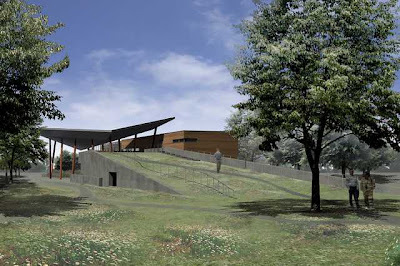 The next selection is the Aldo Leopold Legacy Center in Baraboo, Wisconsin. Previously dubbed the "Greenest Building in the World" via Treehugger and some reported hyperbole via Rick Fedrizzi. 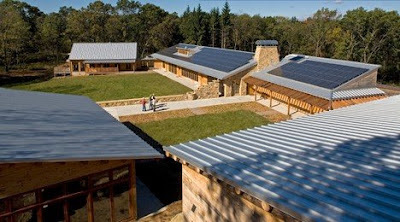 The work of The Kubala Washatko Architects features some great features and is the first 'carbon neutral' operating building recognized by LEED. 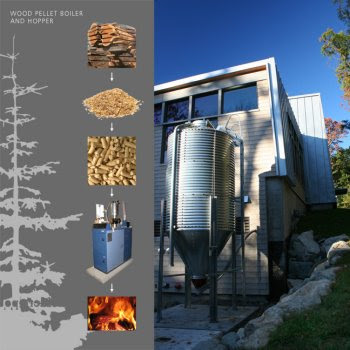 Some site features include wood harvested from on-site trees, rainwater scuppers, and a greater idea of fitting the greater landscape context - something Leopold would have appreciated. The Ceasar Chavez Library in Phoenix by Line and Space featured sustainability with desert style - with rainwater harvesting and storage in a nearby lake - as well as high efficiency landscape irrigation system to cut water use by over 50%. 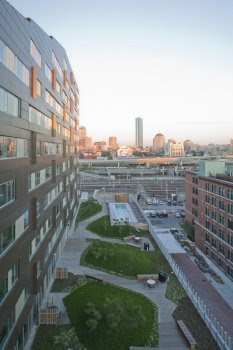 Additionally (via AIA Top Ten): "Water from patio and foundation drains is piped to trees surrounding the library, and condensate from rooftop mechanical units is used to irrigate the vegetated island of the new parking lot." 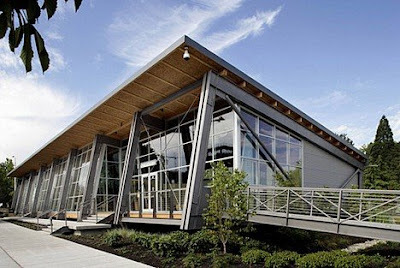 Closer to home, the Discovery Center at South Lake Union by MillerHull is a great example of design for deconstruction and reuse amidst native PNW landscaping. It is interesting to see how temporariness and deconstructabilty lead to a very light touch in regards to landscaping - but I guess that makes sense rather than invest in significant landscaping that will be ripped out eventually (but this building is in a park so that's definitely a debatable issue). The Pocono Environmental Education Center by Bohlin Cywinski Jackson is located in Wilkes-Barre, Pennslyvania for the National Park Service, and involved a creative reuse of materials and simple details. 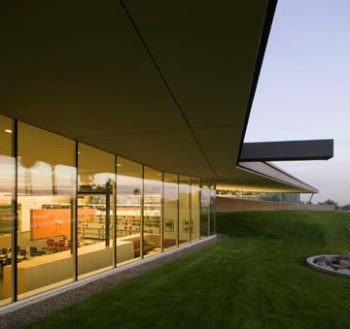 From AIA Architect: "The design is a layered solution in which visitors pass through the forest, cross a wetland, enter the building through an opening in the dark north wall, and cross through a bar of service spaces into the bright, sun-lit main room. The jury said they were impressed by the economy of the project and applauded the use of simple materials and simple details... 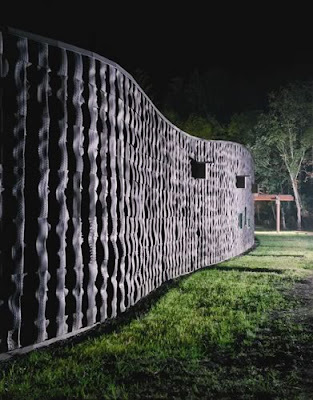 The jury also said they loved the creative use of the discarded tires reclaimed from the site for use as walls." :: Garthwaite Center for Science & Art, by Architerra (Boston, MA). 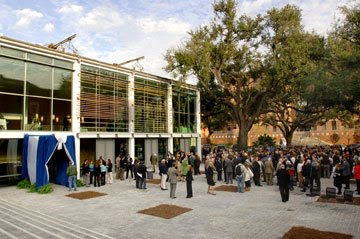 :: Lavin-Bernick Center for University Life by Vincent James at Tulane University. 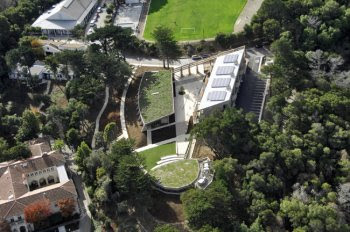 :: Nueva School Hillside Learning Complex by Leddy Maytum Stacy. Finally, one of my favorite projects of the year so far, is the Queens Botanical Garden Visitor Center in Flushing, NY by BKSK Architects has been featured on L+U previously, with a wide range of sustainable features and vegetated architecture - including a native plant green roof, innovative stormwater management, and a mountable sloping vegetated rooftop to ground connection. Check out more on this project here. Overall, it's interesting that these projects, the cream of the green crop is starting to evolve into the realm of integrated site and building, with some inventive irrigation systems and green roofs but there still seems to primarily be the standard disconnect between green building technology and how this interacts with landscape. It's going to be an interesting trend to see how vegetated architecture continues to drive these award winning projects. Should be even more exciting in years to come. Don't forget that the ASLA professional award winners have been announced too! Show some love to the landscape architects. Haha. Great buildings though! Nice blog! Haha! I'm still bitter that the projects we entered didn't win National ASLA awards (again!) - so once the pain dissapates I will be ready to tackle the winners. Notice, on the AIA Top Ten, that they include the teams with LAs - which is a good start. yeah, i really like the direction that architecture is headed. yeah, i'll probably be bitter when my project doesn't win for student asla too. haha. that's what other competitions are for right? haha.